A new flagship for America! Twenty months ago we finally came to the sad realization that the United States Navy had deliberately sunk our nations namesake, ex-USS AMERICA CV66. Shortly thereafter, ex-AMERICA veterans as well as other veterans and citizens came together in a grassroots effort to name the Navy’s next aircraft carrier, CVN78, the USS AMERICA. We wish to acknowledge and thank our fellow shipmates and supporters for the thousands of letters and petition signatures we collected in our efforts to name CNV78 the USS AMERICA. On Tuesday January 16, 2006, at a ceremony held at the Pentagon in Washington D.C., Navy Secretary Donald Winter officially named CVN78 the USS Gerald R. Ford. 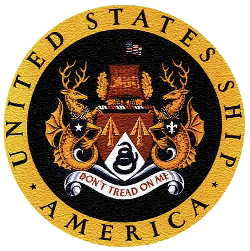 While we were not successful in our initiative to honor our ship, we are currently contemplating a new strategy to name a future Navy ship the AMERICA as a commitment to our belief that the name "AMERICA" belongs on an American Navy ship. Despite our two great disappointments, not being allowed the opportunity to turn ex-America into a museum dedicated to naval aviation, and, the naming of CVN78, it is a comfort to know that CVN78 owes a great deal to the sacrifice of our ship. It was the explosives / damage testing ultimately leading to the demise of ex-AMERICA that will go towards the design and construction of CVN78 USS Gerald R. Ford. The information extracted from ex-America will make CVN78 a stronger more survivable platform than any of her predecessors. “As we gather here today for the naming of CVN78, let me first say to Senator Levin and Senator Warner, thank you for your tireless effort in making the naming ceremony a reality. And thank you for your unceasing support for our men and women in uniform. The naming of the CVN78 the USS Gerald R. Ford represents more than assigning a name to a naval vessel. There is now a unique bond between CVN78 and its new namesake. The permanence of dads name and his new legacy is forever instilled in this new vessel and the men and women who will someday occupy her decks. It is that special bond that gives our family great pride. The USS Gerald R. Ford also shares a unique bond with another ship and her crew. As many of you know, several years ago the USS AMERICA was towed into the Atlantic Ocean and then sunk in a series of tests to verify critical components of the CVN78 carrier program. Those tests were essential to maximize the survivability of the future carrier fleet of the CVN78. 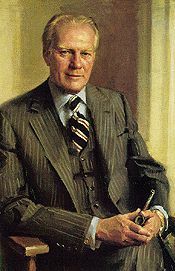 I would like to congratulate the Ford family on this new honor that has been bestowed upon former President Gerald R. Ford. CVN78 is going to be a great ship and with much of her future crew currently in grade school or high school, our future will undoubtedly sail with her!